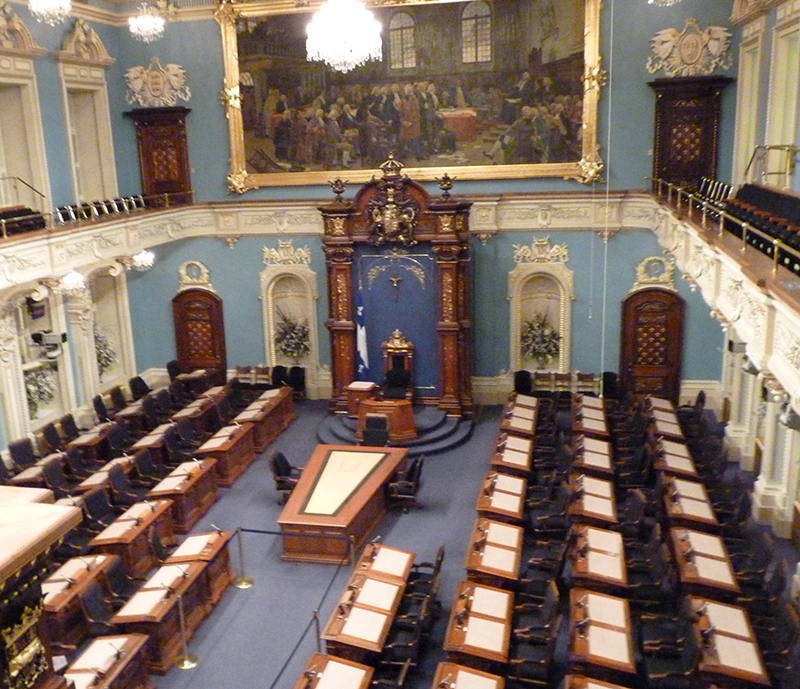 The Quebec provincial legislature known here as the National Assembly (l’Assemblée Nationale), will be back in action this week for the first time since early March, when it was dissolved for the provincial election which took place on April 7th. The election resulted in a resounding defeat of the Parti Québecois (PQ) ministry, which had advocated incessantly for “sovereignty” for Québec from the rest of Canada. The new Québec Premier is Philippe Couillard, who worked previously as a brain surgeon and served as Minster of Health for a time during the last Liberal government of Jean Charest. On Wednesday, Premier Couillard will give the Inaugural Address which will set out in broad terms the agenda his government proposes for the coming years. In early June, a provincial budget will be proposed to the Assembly. There is plenty of work to be done. Mr Couillard announced his Cabinet of 26 ministers at the end of April. A dozen of these are persons who held ministries in the Charest government, while the new Cabinet members bring many strong talents to add to the years of government experience shared by the veterans. This gives all the impression of being a strong team. Premier Couillard has already met with the federal government’s leader, Prime Minster Stephen Harper, and has stated that Québec is ready to take a leading role in the country. Mr Couillard also announced last week that he would be attending meetings with the premiers from the other nine provinces of Canada. This is a marked change from the Québec-centred approach of the PQ. A senior Liberal minister has also already met with the mayors of Montréal and of Québec City, the province’s two largest cities. This too is in contrast with the PQ which seemed little interested in both cities, likely due in part to the fact that its supports came mainly from other parts of Québec. The 19 months of PQ government from September 2012 to April this year fostered a climate of uncertainty, which is never good for the economy. Everyone in business knew of projects which were either put on hold or quietly cancelled, or moved elsewhere in Canada. Hiring was often frozen or reduced by companies as well. The rising rate of vacant office space in Montréal, for example, was another symptom of the PQ’s reign. In addition to the spectre of Québec separation from Canada, the so-called “Charter of Values” and other proposals made by the PQ (see below) were divisive in nature and made many immigrants and English-speaking Quebecers (most of whom also speak French very well) feel unwelcome. It will not be easy to heal this ill-will, re-build the economy and make a more welcoming society for all, including immigrants and minorities in Québec. Mr Couillard’s first weeks in charge have helped foster a strong spirit of optimism built in part on the collective sigh of relief felt by the great majority of voters following the PQ’s defeat. It is hoped that the new Liberal government of Premier Couillard will prove to be up to the task over the next four years. Their determination to have Québec play a leading role inside of, instead of aloof from, the rest of Canada should serve to help forge a stronger province and country. Perhaps it says something about Quebecers’ collective intelligence that we chose a brain surgeon to lead us. The PQ won the September 2012 election, but as a minority government, capturing only a few more seats than the Liberals. The balance of power was held in the National Assembly of Québec by the then newly-formed Coalition d’Avenir du Québec (Coalition for Quebec’s Future, the CAQ). However the PQ proved quickly that power can lead to arrogance. It waged a constant war of campaign-style rhetoric, daring the opposition parties to defeat it in the Assembly and force an election. The PQ tried to tug at the heart-strings of what its strategists felt were “conservative” or “traditional” voters ripe to switch allegiances from the CAQ, and thereby win a PQ majority in the next election. And so the PQ government introduced measures to make the rules on use of the French language in businesses more stringent, based on their contention that French is under onslaught from the English language, as well as proposing a so-called “Charter of Values” to outlaw the wearing of religious-based headgear by public employees as a means of protecting and preserving “Québec values and culture”. When the PQ called the election in March 2014 they felt they had a comfortable lead over the Liberals in popular opinion with key policy elements in place to win. They also believed they would not have to deal with the first article of their party constitution, which is that the party must strive for an independent Québec. However, just a few days into the campaign, the issue of holding another referendum on sovereignty came to the fore. Star candidate Pierre Karl Péladeau, a businessman and owner of major Québec media companies, made a speech wherein he spoke of wishing to build an independent country for his children, raising and shaking his fist for dramatic effect at its conclusion. Then PQ Premier Marois was seen standing at Péladeau’s side applauding. For the next few days Mme Marois speculated publicly about having open borders to welcome Canadians to visit Québec, what currency would be used, whether there would be Québec passports, etc. Then suddenly under obvious warning from her advisors, Marois tried to change her tune. She tried to play both sides of the referendum issue, by refusing to abandon its possibility to assure loyal PQ supporters while also claiming that if elected her party would not hold a referendum unless Quebecers were ready for one. Remembering that the last referendum in October 1995 was called by the then PQ majority government within a year of its election to power, voters balked at the too cute by half statements of Mme Marois and deserted the PQ rapidly. By voting day on April 7th the PQ’s share of the vote had slipped to the lowest in its history. The vote in the 1995 referendum was 49.42% in favour of an independent Québec and 50.58% percent for remaining part of Canada. The first referendum on this issue held in May 1980 under another PQ majority government was 40.44% for a “mandate to negotiate” sovereignty for Québec and 59.56% opposed. Given that the PQ’s support is seen as strongest in the 55 and older age group, and the latest election results, supporters of a united Canada hope that the spectre of another referendum on Québec independence will be out of the picture for many years to come. Stephen Fogarty is a member of the Quebec Bar and of the Law Society of Upper Canada, and honorary legal advisor to the Embassy of Ireland in Canada. He practises immigration and citizenship law at his office Fogarty Law Firm in Montreal, Twitter @Stephen_Fogarty and website www.fogartylaw.ca. The views expressed in this article are Stephen’s alone and do not purport to reflect those of any other person or organization. This article is for information purposes only and is not published to offer or to replace legal advice.